fuse panels, engine compartment fuse box, brake on/off switch, clutch pedal position switch jumper, clutch pedal position switch, brake pressure applied switch, remote keyless entry module, horn relay, clock springs, speed control/horn switch assembly, powertrain control module, instrument cluster, programable speedometer/odometer module, rear axle sensor, diff speed sensors low, diff speed sensor high, rear anti-lock brake module, RABS data link connector. The other thing you have to consider before waorking is the color codes. 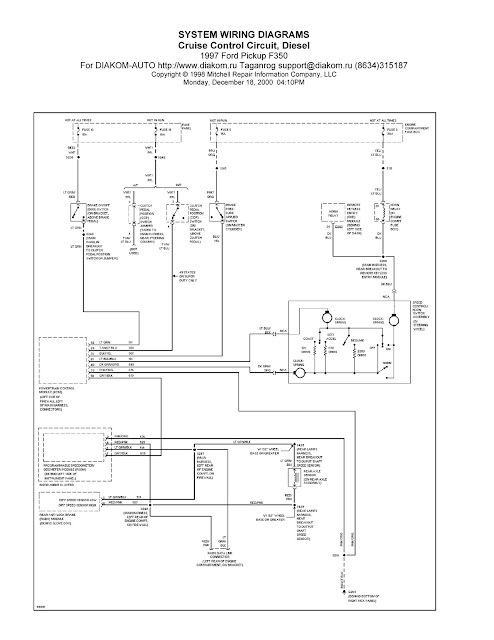 The color codes in this schematic wiring diagram functions to make easy the worker in determining the wires. So, it is important to understand. And by understanding the both, parts and color codes, you are ready to work on your 1997 Ford Pickup F350 cruise control circuit. Here is the clear and readabe schematic wiring diagams you can observe to get the details. Click on the image to enlarge. Or you can save it into your harddrive, it is suggested using the picasa photo viewer for getting the finest view.